Read the word "nappy" and memories of the times I used to fold the white muslins for my nieces and nephew came to mind. A girlfriend once said the usage of nappies was made possible by having the helper in the house do the laundry and we all know the work that's got to go into ensuring those muslins come out white after a big (poop) job. Modern nappies these days come in such exciting colours. A little rinse, throw them into the machine and they are as good as new. No pre-folds necessary. It really is that easy. I was a little apprehensive, to be honest, whether the nappy will hold its own (pun intended) when it came to the low and the dirty. Bud poos every 3-4 days. When poop day comes, I can hear the diaper shi*ting in its pants (another pun intended) 'cos it sure is a sh*t load, lemme tell you that. Bud wears the Bumwear Pocket Diapers and so far, it hasn't disappointed. 4) I could pass this down to Baby #2. We've also been using Seventh Generation. 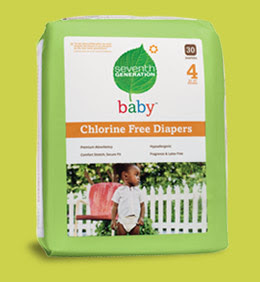 The disposable diapers are free from chlorine bleaching, hence the natural brown hue. It is hypoallergenic and free from fragrance and latex. A pack of 40s cost $15.50 from NTUC Finest which doesn't cost anymore than your Mamy Pokos and your Pampers at S$0.38 a pop. There were times where the diaper couldn't contain the load. Bud's clothing was wet either at the back or at his side within the hour after a change. That was during the initial stage so it could've been that we didn't put on the diaper properly. As a breastfed baby, Bud's poo tends to be runny. On poo days, the yellow will inevitably stain the leg gathers onto his upper thighs. So we've haven't actually used it at night. I've recently ordered another eco friendly disposable diaper from Oko Loco which brings in Moltex biodegradable diapers . Will it do better than Seventh? I can't wait to find out. Watch this space for the review.